Dealing with self-harm scars definitely varies from person to person. My thoughts towards my own scars sometimes varies from day to day. You may worry about their physical appearance or their significance to you when it comes time to heal. Covering scars. Scars can bring attention. People might stare that them (although, you’ll probably think people are staring more than they actually are, but it still can be uncomfortable) or perhaps ask you questions. Questions aren’t always bad. These individuals may just be trying to make sure you’re okay. But if you really don’t want attention drawn to your scars, you can cover them up. Obviously you can wear pants or long sleeves. If you have marks on your wrists you can cover them up with bracelets or a watch. Of course covering up with clothes can draw attention during warmer months of the year. It may be impossible to avoid suspicion. If you are asked if you are hiding something you may want to briefly tell that person what’s wrong (lying can get you into uncomfortable situations later) then politely tell them you wish not to pursue the conversation further. But I strongly suggest that if the person asking you is someone you can trust, confide in them. Even if the person already knows that you self-harm, it can be helpful for you to tell them if you relapsed, rather than bottling it up. Showing scars. Maybe it’s too hot to wear clothes that cover your scars. Maybe you wanted to wear a certain outfit. Or maybe you really just don’t want to hide your scars. That’s okay too. It’s totally up to you. And I understand wanting to be comfortable with your body. But again, be aware that there is a greater possibility of people asking you about your scars. Letting scars heal. For me, this is one of the hardest parts of quitting self-harm. Generally I think most of my scars look disgusting. I refuse to wear shorts or dresses without stockings, usually even within the comfort of my own home (where my family is aware of my scars). And oftentimes I will get upset because I know some of my scars won’t completely heal, or at least not for many years. Yet even with all these negative emotions towards my scars, I panic when they start to heal. A few times my family has mentioned looking into treatment to eliminate or lessen the severity of scars, and I always answer that I’m not interested. There are many personal reasons I have for not wanting my scars to heal completely. Firstly, if they all were to disappear, I might miss them and just hurt myself again. This sounds strange, especially from someone who thinks her scars are hideous, but I think it time and time again. I’ve been living with these scars for years so I’m used to them. On the other hand, scars can be seen as a type of “battle wound”. I can look at them and remember maybe not exactly when I made them, but remember the general feelings I had at the time. Some scars I can trace back to some very bad days. In this sense, when I look at them, I can recall that I made it through these feelings, even if the outcome was a bit messy. As bad as self-harm is, suicide is worse. So in this way the reminder can be helpful. From a more negative viewpoint, sometimes I don’t want my scars to heal because I don’t think I deserve to have beautiful skin. There can be many reasons why people might not want their scars to heal completely. 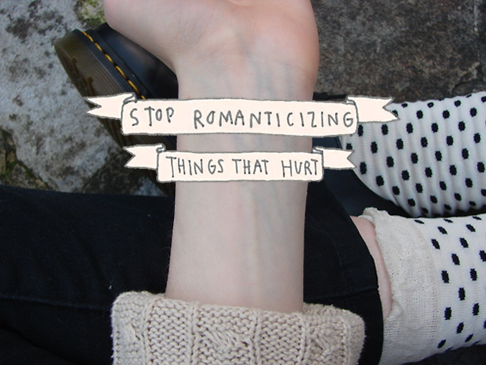 But despite all of that, try to allow your scars to heal. Try not to pick at the wounds or re-harm the same area in an effort to make the scar permanent. As hard as it can be, a big part of quitting self-harm is letting yourself heal both emotionally and physically. Just as you don’t want to dwell on the same depressing thoughts, don’t dwell on your scars. You may decide to show your scars or to hide them. You may want your scars to heal or you might not. Whatever your situation is, remember that your scars do not define you, no matter how long you have had them. Your scars do not decrease your worth as a human being. You deserve to heal, but first you must allow yourself.